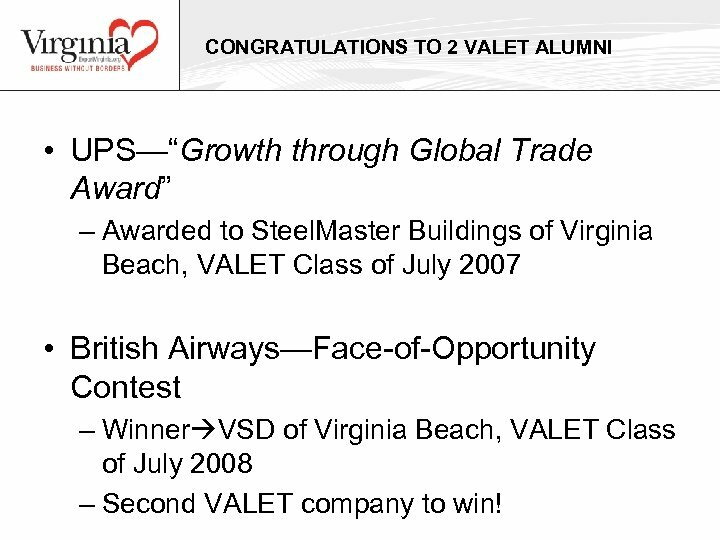 CONGRATULATIONS TO 2 VALET ALUMNI • UPS—“Growth through Global Trade Award” – Awarded to Steel. 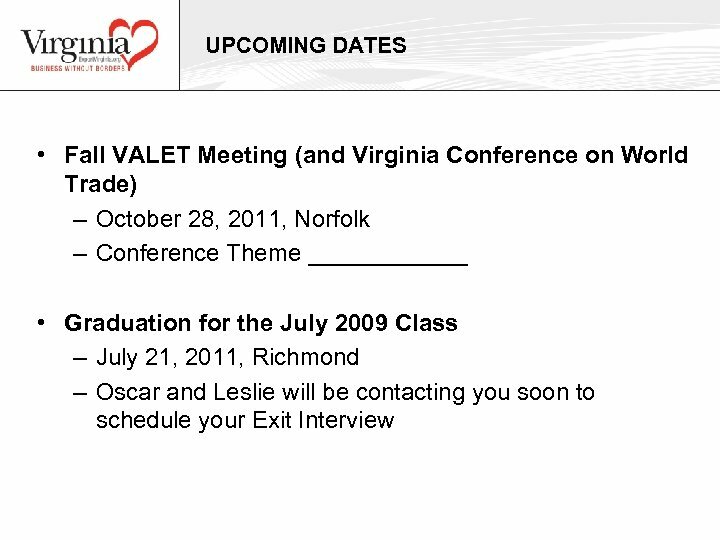 Master Buildings of Virginia Beach, VALET Class of July 2007 • British Airways—Face-of-Opportunity Contest – Winner VSD of Virginia Beach, VALET Class of July 2008 – Second VALET company to win! 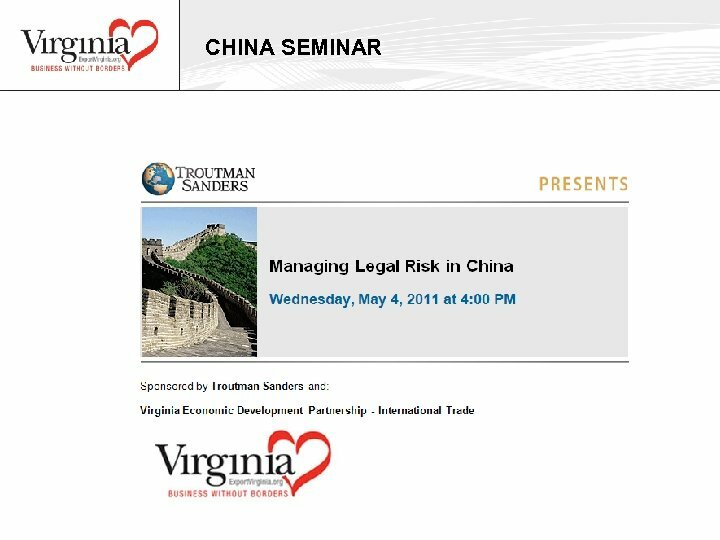 BLOG FROM AUSTRALIA! 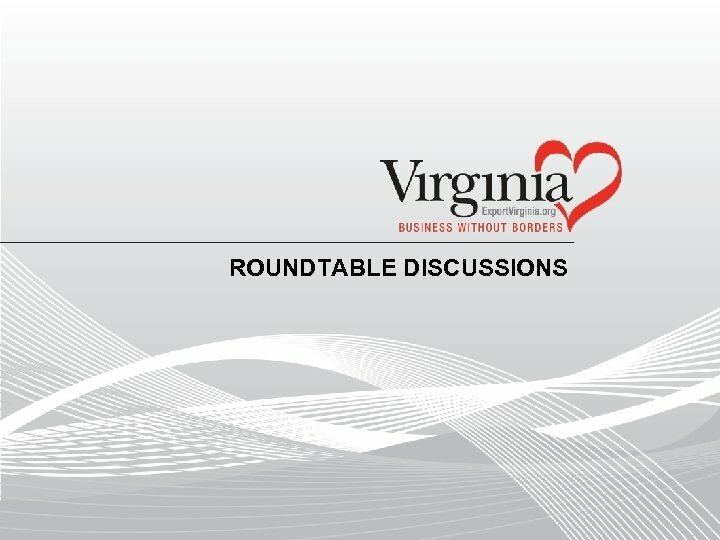 • Colleen Jolly of 24 Hour Company • VEDP Group Market Visit to Australia • Virginia Business Blog – http: //www. 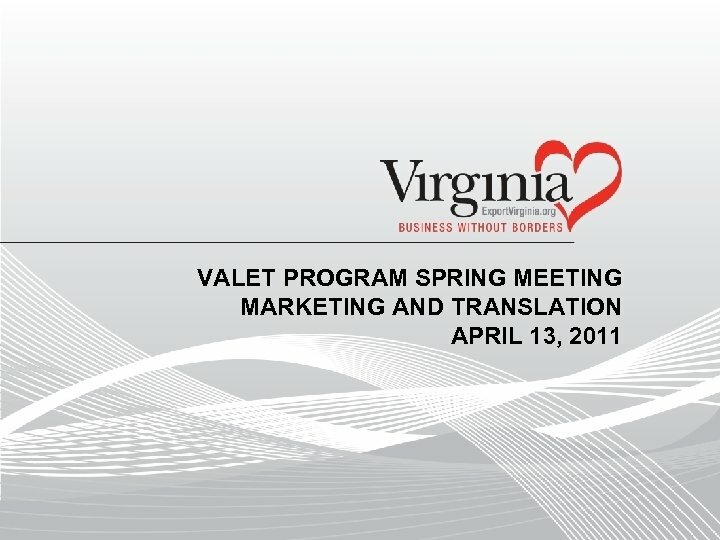 virginiabusiness. com/index. php/blo gs/Australia_trip/ • Check it out! 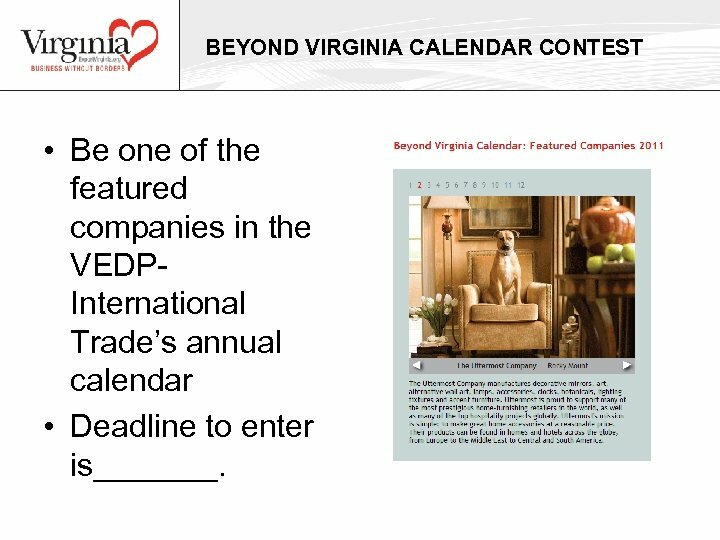 BEYOND VIRGINIA CALENDAR CONTEST • Be one of the featured companies in the VEDPInternational Trade’s annual calendar • Deadline to enter is_______. SURVEY RESULTS • We currently use Facebook, Twitter, and Linked-in. 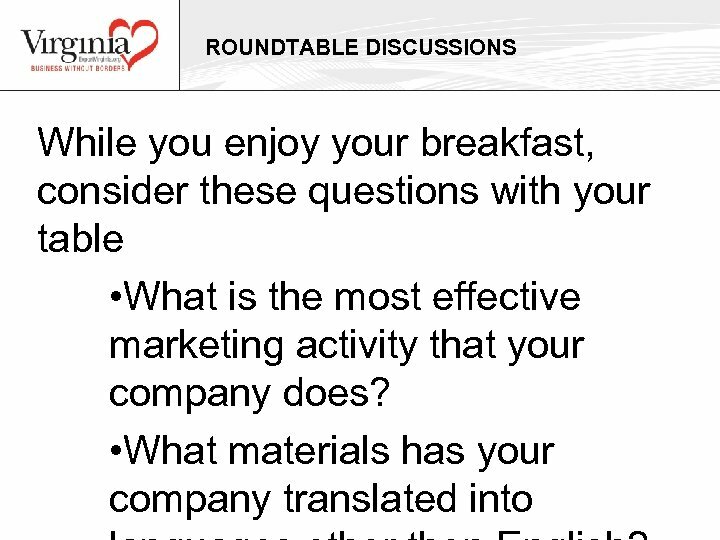 These are FREE useful marketing services, which allow us to reach out to customers with product updates, promotions, and company news. 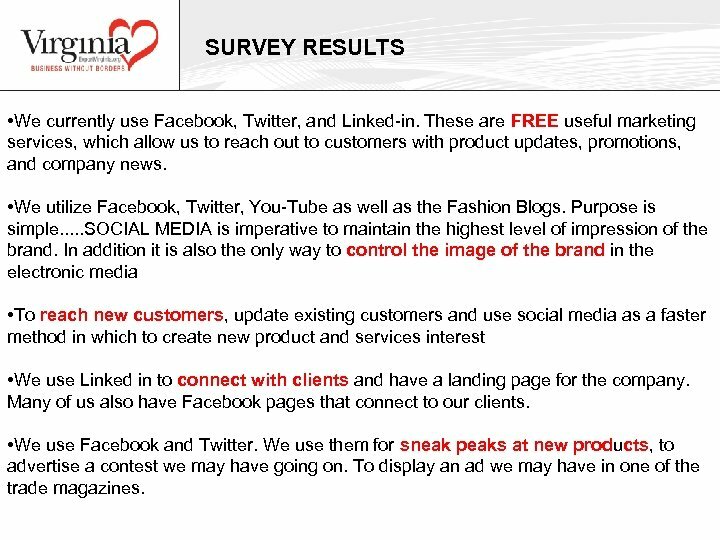 • We utilize Facebook, Twitter, You-Tube as well as the Fashion Blogs. Purpose is simple. 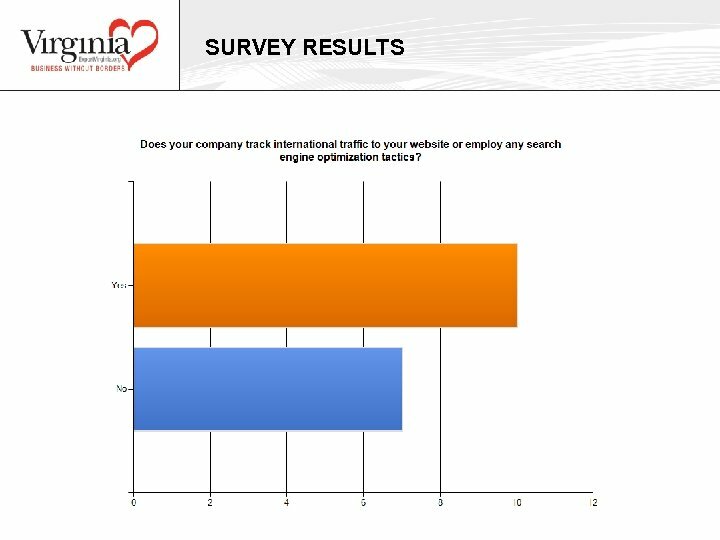 . . SOCIAL MEDIA is imperative to maintain the highest level of impression of the brand. 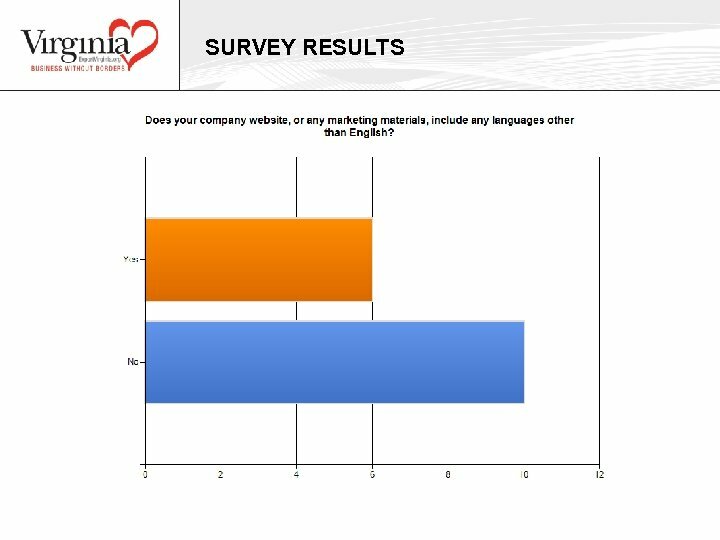 In addition it is also the only way to control the image of the brand in the electronic media • To reach new customers, update existing customers and use social media as a faster method in which to create new product and services interest • We use Linked in to connect with clients and have a landing page for the company. 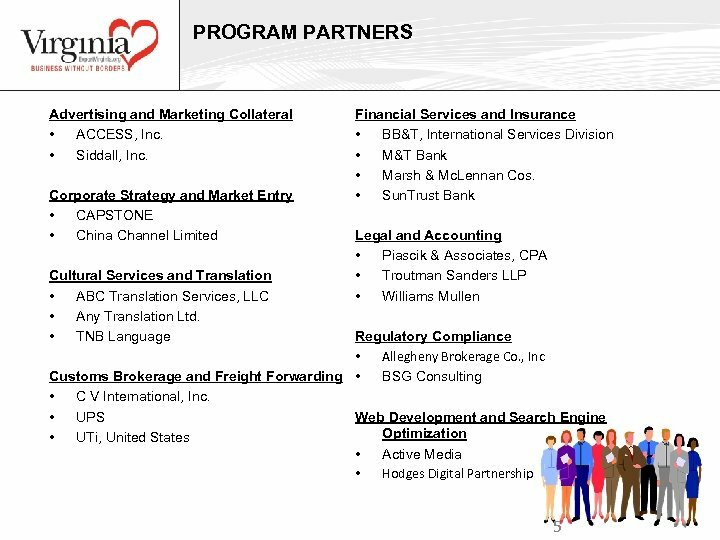 Many of us also have Facebook pages that connect to our clients. 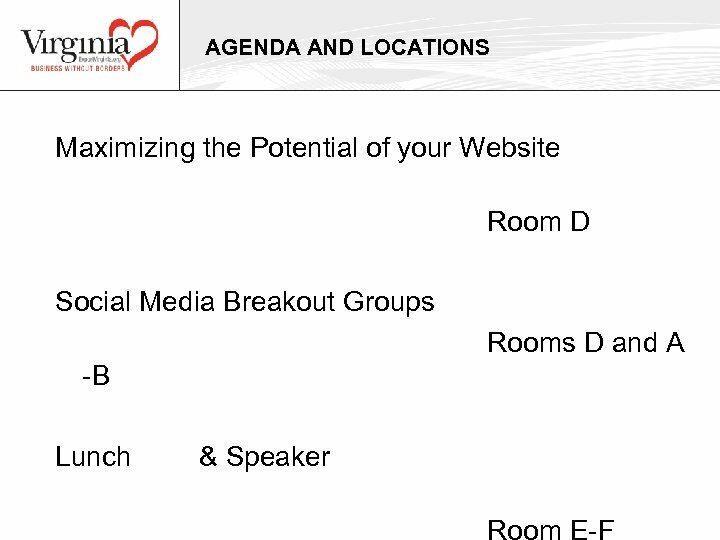 • We use Facebook and Twitter. We use them for sneak peaks at new products, to advertise a contest we may have going on. 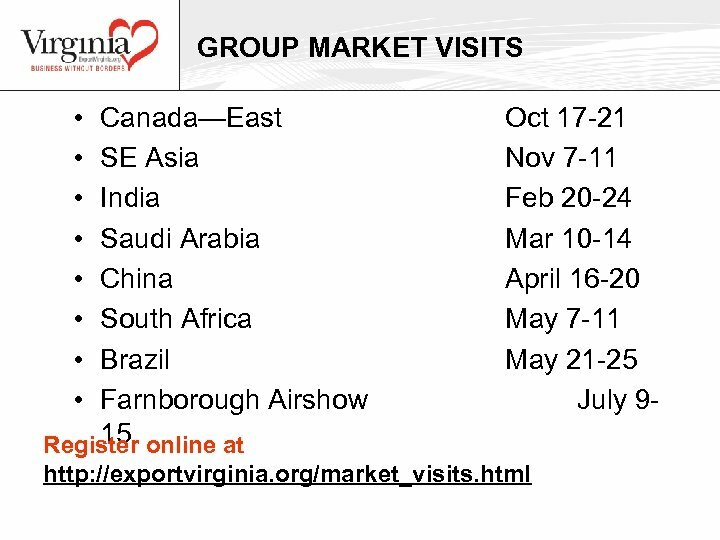 To display an ad we may have in one of the trade magazines. 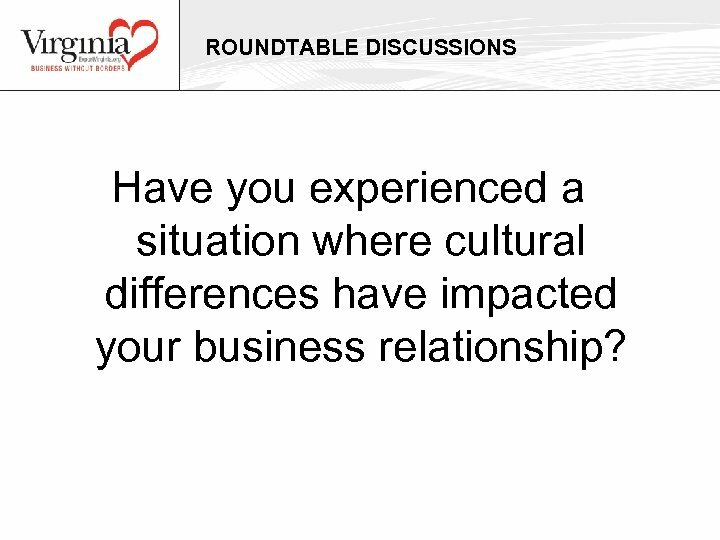 ROUNDTABLE DISCUSSIONS Have you experienced a situation where cultural differences have impacted your business relationship? 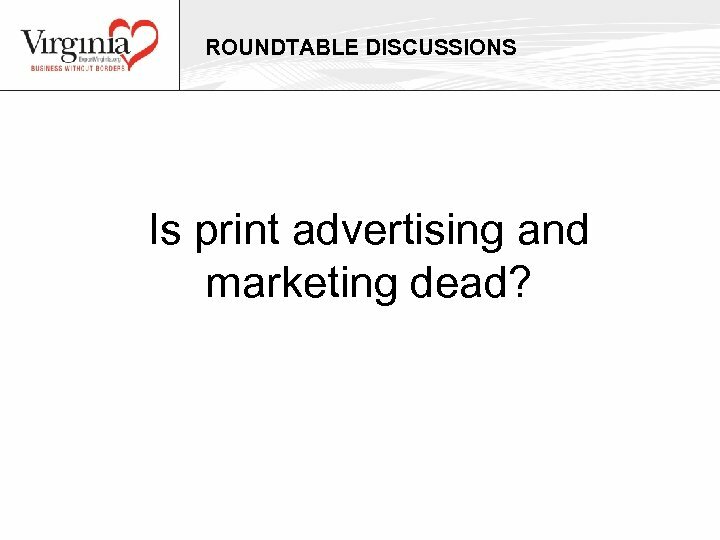 ROUNDTABLE DISCUSSIONS Is print advertising and marketing dead?